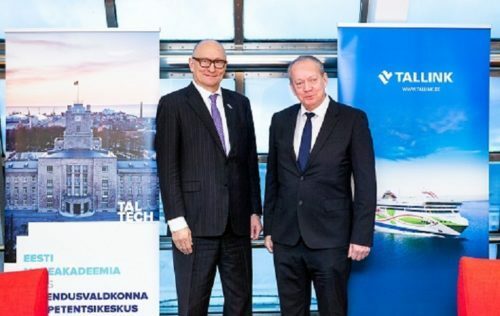 Tallink and TalTech have signed a collaboration agreement with the aim of developing various solutions for Tallink Grupp’s vessels over the next two years. According to the two-year €100,000 co-operation agreement, signed by Member of the Management Board of Tallink Grupp, Lembit Kitter and the rector of TalTech, Jaak Aaviksoo (pictured), the focus of the project will be on developing the so-called ‘Smart Car Deck’ solutions. This project will be aligned with the Smart Port solutions already in use today and would result in innovative technologies that would make the ships’ car decks and their operations more efficient. The expected results of the Smart Car Deck project, among other things, are the increased efficiency of the operations, a reduced need for workforce for the loading and unloading of ships, enabling the workforce to be used for other specialist duties, and a reduction in the waiting time for embarkation and disembarkation. “The ports around the Baltic Sea have already developed or are currently developing several ‘Smart Port’ solutions for easier vehicle check-in, for directing traffic in ports, etc, all of which has enabled the ports to make the processes involving vehicles automated and thus more efficient. “The Port of Tallinn with its solutions is no doubt one of the pioneers for these solutions in the region. Our ships are important partners and customers of the Baltic Sea ports and therefore it is only logical that alongside the smart ports we must also create smart ships,“ Paavo Nõgene, Tallink Grupp CEO, said. “Our ambition is to be a partner for and a pioneer in developing smart solutions for the shipping industry both here in the Baltic Sea region as well as globally. Our goal initially is to extend the Smart Port solutions used by Baltic Sea ports to the car decks on our vessels and I am certain that we will successfully develop such solutions over the next few years in partnership with TalTech,“ he added. “TalTech is pleased to help Tallink Grupp develop smart solutions, which will help reduce the waiting times before embarking the vessels and will make the more routine every-day work more automated. “Our goal is to focus on three main topics during this development project. First, to automate the vehicle traffic flow. Second, make the usage of the deck more effective. Third, to guide the passenger in the vehicle to the right parking zone and guide passengers to the nearest exits. “On the one hand, the Smart Car Deck is an extension of the Smart Port solutions and, on the other hand, it is a good example of how the results of scientific research achieved through the co-operation of TalTech and enterprises, can be applied in real life,“ said Jaak Aaviksoo, TalTech rector.